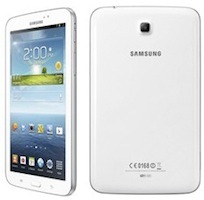 Samsung Electronics has further expanded its Galaxy tablet range by unveiling a 7 inch tablet called Galaxy Tab 3. Unlike the company's other power-packed devices, this one is targeted at the mid-price range segment. While the price of the device is not available as of now, the company has introduced two versions of the tablet- a Wi-Fi only version and a Wi-Fi+3G version. Here is a look at the specifications of the device. The tablet has a 7 inch WSVGA touchscreen display (1024Ã—600 pixel resolution) with 169 pixels per inch density and runs on the Android 4.1 (Jelly Bean) operating system with Samsung's TouchWiz user interface. It is powered by a 1.2 GHz dual-core processor, has 1 GB of RAM and in terms of internal memory, users will have a choice between 8 and 16 GB models. There is also a microSD slot to expand the device memory by an additional 64 GB. As for the camera, it has a 3 mega pixel rear camera which can record videos and a 1.3 MP front-facing camera for video calls. On the connectivity front, the device has Bluetooth 3.0, Wi-Fi (with Wi-Fi direct), 3G, and it also comes with a microSD card slot. The device has a 4,000 mAh battery that should provide decent battery life and comes with GPS (with A-GPS support). Considering its specifications, we feel that the tablet will be priced in the Rs 10,000 â€“Rs 16,000 range (for both the versions) and could give serious competition to the low-priced tablets by home-grown manufacturers (like Micromax, etc.). in this range, the tablet will compete with iBall Slide 3G (Rs 15,990), Lenovo Ideapad A1 (Rs 15,628), Viewsonic ViewPad 7 (Rs 14,790), ASUS's Google Nexus 7 (Rs 15,999) and the recently launched Fonepad (Rs 15,999). While the Wi-Fi only version will be available globally beginning next month, the 3G version will follow in June 2013. Whether the tablet is worth a buy or not, will primarily depend on how the company decides to price it. At sub Rs 10,000 it could be a runaway success among first time tablet users. Question is how aggressive will Samsung get to capture the mass end of the market.